Like most successful business owners and executives, you are an independent thinker. Not one to join the herd following the latest trends, you would rather avoid wasting capital and effort. 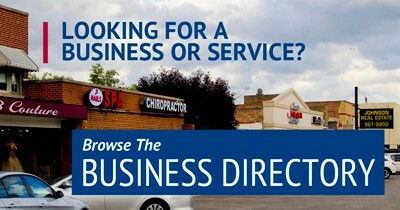 At the same time, you are not about to be left behind when a you see the value in the prudent application of technology. Technology is constantly changing, making it a challenge to keep up with the advances in cloud technology and how it impacts your business. It can seem daunting when you consider your options and are not sure how or where to start to make the most of your investment. Ready to see where you stand? 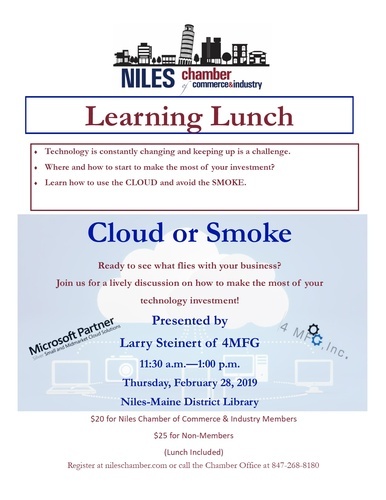 To learn more about what is the cloud and what is smoke, join us for a lively discussion on ‘Cloud or Smoke’ hosted by the Niles Chamber of Commerce & Industry and presented by Larry Steinert. Lawrence Steinert is a Microsoft Certified Professional and Constant Contact Certified Solution Provider. He has been involved in technology since 1999 and is passionate in helping make the world a better place using technology. 4 MFG clients range from sole proprietors to small and mid-sized businesses. As a Microsoft Certified Solutions Associate and Cloud Solutions Specialist, Lawrence works with Business to prudently implement technology. Under the Constant Contact Certified Solution Provider Program, he provides clients access to Constant Contact’s online marketing platform and additional marketing services to help them reach current customers and find new ones in all the places that matter: email, social, mobile, and web.